Russian Forces Repel Another UAV Attack On Hmeimim Airbase, Threaten Militants In Idlib With Military Action 5 out of 5 based on 14 ratings. 14 user reviews. On July 21, the Russian Centre for the Reconciliation of Opposing Sides in Syria announced that Russian air defense systems in Hmeimim airbase detected and destroyed several armed unmanned aerial vehicle (UAVs) which attempted to attack the airbase. According to the statement, the UAVs were launched from the opposition-held areas in the northern Lattakia countryside. “From the territory occupied by militants, launches of unmanned aerial vehicles in the direction of the air base Hmeimim are not stopping. 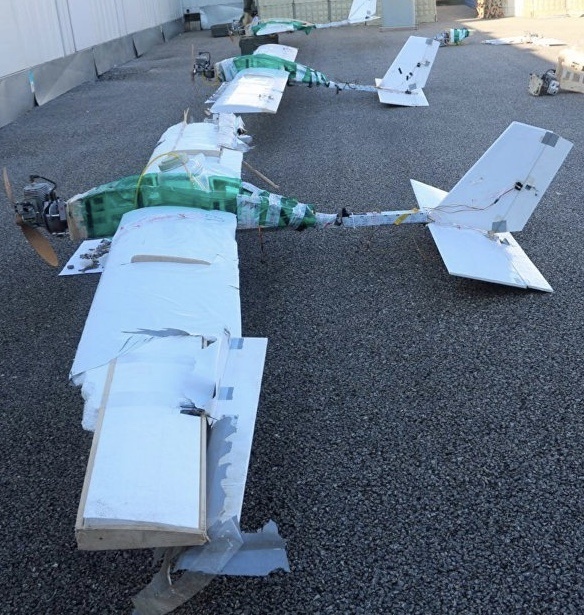 On the night of July 21, air control at the Russian Hmeimim airbase detected a UAV launched from territory controlled by illegal armed groups in northern Lattakia,” the Russian reconciliation center said in its statement, according to the Russian news agency Sputnik. Since the beginning of July, dozens of armed UAVs have attempted to attack Hmeimim airbase on a regular basis. However, Russian forces have managed to destroy or jam all of them. A day earlier, the head of the Russian reconciliation center, Major General Alexei Tsygankov, warned that the militants in the governorates of Idlib and Lattakia have increased their combat activity. Maj. Gen. Tsygankov also confirmed that all the armed UAVs were launched from the militants-held areas. “Launches of attack aerial drones are being carried out from the territory occupied by militants,” Sputnik quoted Maj. Gen. Tsygankov as saying. Maj. Gen. Tsygankov added that the Syrian Arab Army (SAA) is now “forced to take appropriate measures to stabilize the situation in the region,” which hints that Russia will not tolerate these violations of the de-escalation agreement anymore. Recently, some Syrian pro-government activists have claimed that the SAA, backed by the Russian Aerospace Forces, will soon launch a military operation to secure the northwestern Latakia countryside, the northern Hama countryside and parts of the western Idlib countryside. good plan so get over with it and then move north. Yep, I think so as well and then kick the dessert ISIS squads out with minimal to medium forces… whilst the others rest a week or so. After Idlib + the last remaining ISIS scum in Eastern DaZ is done, back to Al-Tanf; if the Yanks do not leave willingly, kill them all…….. then onto the East of the Euphrates. My view only. Yes. All indications point to the intention to neutralize the militant threat in Idlib, which justifies military operations for that purpose in the deescalation zone. They have this well planned out. While all this is going on, what happened to Erdogan, he is not exactly known as the ‘quiet’ type? Well that is interesting, Erdogan busy eliminating foes real and imagined. Why would Erdogan take this course of action? Hmmmm. Well, if Erdogan truly breaks with the US and NATO, he would expect US retaliation and all the bag of tricks – regime change for example. And Erdogan has plenty of reason to fear such given that CIA backed coup attempt not to long ago. So maybe Erdogan is doing a thorough cleaning house so that the US has little to work with in any future Turkish regime change project. As for the Kurds, I am surprised by there foolishness and poor judgement. They will pay a heavy price for it. Meanwhile, Americans are wondering what to do with the 1,000 ISIS fighters in their “custody” !! Another “Break for the Border” with Israel or Jordan? I wonder? Yes, I have just seen and commented on the article. Have a look at it, the advice is basically kill them, kill them or send to Israel. They have probably located them already, I guess they are just waiting for the massive offensive to begin. In a few weeks from now, (3 or 4 at the most) the Russian aerospace forces and the Syrian air force will turn Idlib province in a huge bombing fest, you’ll see. America would claim to have located them, so they could bomb schools and hospitals. Surely you don’t want Russia to sink to the same level of depravity as the USA? Because this isn’t a Hollywood movie. UAVs only help if they are watching the exact area at the right time and Satellites aren’t magic, they zoom in and out like any other camera, you can get a large area at low resolution or a small area at high resolution. Not to mention that even if you identify the exact point of launch the chances of the attacker still being there are slim to none. America says a lot and most of it is absurd nonsense, why would their claims in this regard be any different? Those kinds of UAVs are carried in trucks and launched from any open area. Maybe they’ll be able to pinpoint the factory (probably in Turkey or Israel LOL). Yes, they can 100%, but retaliation decision making is the problem. 1) Chemical Weapons, nerve agent and nuclear weapons production and storage facility at the Dimona, Negev Desert. 2) The Dimona nuclear reactor at the Negev Nuclear Research Center, where Israel has produced 400 nuclear weapons 5kt to 250kt. 3) Israel Institute for Biological Research (IIBR) which are developing biological and chemical weapons. It is located in Ness Ziona, 20 kilometers south of Tel Aviv from where chemical plant had supplied to terrorists in Syria to produce chemical weapons and use against Syrian nation. 4) The Israeli aerospace hardware manufacturing facilities for Jerico I/II/III Ballistic missiles from 70km to 11,000km ranges, cruise missiles, UAVs, SAM missiles etc. in the city of Lod in the Central district. Best idea I have seen written anywhere all year …… or any year ! 5th generation war in which the country’s regime should be vigilant. Isn’t that WHY you’re collecting them all in one place? It’s a warning to the FUKUS troops, that are leading the jihadists. I imagine this will form part of the cassus belli, the constant press releases simply create a public record that will support the eventual justification for action in Idlib. Remember that Russia is not the US, so they need to find a legal justification with corroborating evidence before fighting, they can’t just shout chemical weapons and start murdering people. Terries in and Civvies out. Clear out the terries – like Aleppo and Daraa etc. When this lot want to evacuate – let them don their White Helmets. Israel, Jordan, US, Canada and EU – and I hope they enjoy them. Or… send them east of the Euphrates. Good opportunity to test air-defense systems. Question should be asked publicly and loudly: WHY have Israel & US armed these Terrorist-Thug Jihadi-Salafist-Filth been supplied with the means and equipment to build these UAV’s / Drones?? I wonder where the rebels are getting these drones and other tech. Can we assume that it is from Western Governments or Israel? Russian general states the SAA is now ‘forced to take the appropriate actions to stabilize the situation in the region’. Military operations are permitted in deescalation zones to eliminate terrorist threats and so the justification is already being established for the Idlib operation. Meanwhile, Erdogan seems oddly silent and he is not known to be the quiet type. On issue of Erdy-Nerdy, please see my comment above: he is concentrating on weeding out all Opposition to him in Ankara and Istanbul. Time is running out for Idlibstan. Soon to be renamed craterstan, known for picturesque scenery of many blackened bomb craters that now scatter the land where herds of the now extinct wild headchoppers used to roam. yes excellente excuse for offensive against idliebistan!! Anyone know where these Fuxxers are sourcing their Drones / UAV’s?? Someone or some State has supplied them with them and/or the technology to build them!